At the end of WWII, an agreement was reached at the Bretton Woods Conference which pegged the value of gold at US$35 per ounce and that became the international standard against which currency was measured. But in 1971, US President Richard Nixon took the US$ off the gold standard and ever since the US$ has been the most important global monetary instrument, and only the US can print them. However, there were problems with this arrangement not least of all that the US$ was effectively worthless before it reneged on the gold-standard. But more importantly because it was the world’s reserve currency, everybody was saving their surpluses in US$. To maintain the US$’s pre-eminence, the Richard Nixon administration impressed upon Saudi Arabia and therefore Organisation of Petroleum Exporting Countries (OPEC) to sell their oil only in US$. This did two things; it meant that oil sales supported the US$ and also allowed the USA access to exchange risk free oil. 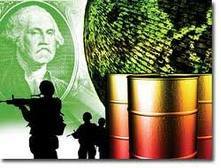 The USA propagates war to protect its oil supplies, but even more importantly, to safeguard the strength of the US$. The fear of the consequences of a weaker US$, particularly higher oil prices, is seen as underlying and explaining many aspects of the US foreign policy, including the Iraq and Libyan War. The reality is that the value of the US$ is determined by the fact that oil is sold in US$. If the denomination changes to another currency, such as the euro, many countries would sell US$ and cause the banks to shift their reserves, as they would no longer need US$ to buy oil. This would thus weaken the US$ relative to the euro. A leading motive of the US in the Iraq war — perhaps the fundamental underlying motive, even more than the control of the oil itself — is an attempt to preserve the US$ as the leading oil trading currency. Since it is the USA that prints the US$, they control the flow of oil. Period. When oil is denominated in US$ through US state action and the US$ is the only fiat currency for trading in oil, an argument can be made that the USA essentially owns the world’s oil for free. Now over $1.3 trillion of newly printed US$ by US Federal Reserve is flooding into international commodity markets each year. After considerable delay, Iran opened an oil bourse which does not accept US$. Many people fear that the move will give added reason for the USA to overthrow the Iranian regime as a means to close the bourse and revert Iran’s oil transaction currency to US$. In 2006 Venezuela indicated support of Iran’s decision to offer global oil trade in euro. In 2011 Russia begins selling its oil to China in rubles. The radio waves of HAARP can be used to produce such intense vibrations as to cause an earthquake. HAARP based technology can be used to encourage/produce various weather phenomena such as hurricanes, flooding, or drought through manipulation of the ionosphere. Already Russia, China and Venezuela have suggested that a HAARP type technology weapon is capable of such and attack and possibly been used against several countries. What would the probable response be to such an attack be? An armed conflict with the US? Or perhaps something more within reach and even more damaging at this point, the elimination of the Petrodollar system and a subsequent dumping of surplus US$ into the international and US financial markets resulting in the quick collapse of the US$. Attacking these countries with HAARP would destabilize their economies and currencies and prevent a move away from the US$ and the Petrodollar system. This entry was posted in Economics, HAARP and tagged HAARP, oil cartel, petrodollar, us government, war. Bookmark the permalink. It is really easy to start printing money, but it is incredibly hard to stop. Like any addict, the Federal Reserve is promising that they can quit at any time, but they refuse to even start tapering their money printing a little bit. Federal Reserve seems to be convinced that any “tapering” could result in the bursting of the massive financial bubbles that it has created. Federal Reserve beleives as the market seems not to, that the current “recovery” could not survive without continuation of massive monetary stimulus. Federal Reserve is usually very careful not to do anything which will hurt the short-term interests of the financial markets and the big banks. If Federal Reserve continues to pump, the financial bubbles that it has created will get even worse. If Federal Reserve stops, those bubbles will burst. But it is inevitable that these financial bubbles will burst at some point one way or another. The Federal Reserve is trapped and can’t end tapering or else the bond and stock markets will blow up. The longer this continues the bigger the inevitable burst. While the Federal Reserve has been recklessly printing money out of thin air, household incomes have actually been going down for five years in a row… The employment to population ratio fell from about 63% before the last recession down to underneath 59% at the end of 2009 and it has stayed there ever since. So if quantitative easing has not been good for average Americans, who has it been good for? The wealthy, of course. This is fantastic for every rich person – This is the biggest redistribution of wealth from the middle class and the poor to the rich ever. The US manufacturers who can’t compete with low priced Chinese goods must either lower their costs or go bankrupt. To lower their costs, many US manufacturers are outsourcing to India and China, adding more unemployment in the USA. Manufacturing jobs in the USA declined 35% between 1998 and 2010. Since manufacturing industries declined in the USA, the US competitiveness in the global marketplace is also declined. The US economy is in a deep hole and US shouldn’t dig any more. Reckless money printing known as “Quantitative Easing” and economical stimulus packages introduced in the aftermath of the Credit Crunch, has made very little impact on the growth of the US economy. Current US economical growth is not adequate enough to create jobs and to get an economy back on track. The USA is living beyond its means and cannot cut expenditures or increase taxes to narrow the deficit. Now the banks are under enormous pressure to lend more money but reckless lending by banks got the US into this mess in the first place. The credit crunch initiated in 2007 in the subprime mortgage market in the US had devastating spill-over effects for China’s exports. The scarcity of US$, due to the repatriation and deleveraging flows into the US financial system caused a sudden plunge in the external demand for goods manufactured by China and triggered the consequent lay-off of several millions of workers in China. This experience encouraged China to use its own currency in trade. The political and economical leadership of the US has chosed to cartel profits and transformed the US economy to serve the colluding and unlawful oligarchy. The US banks are borrowing money at near zero interest from the US government, then lending it to the US government at even mere fractions higher interest than they are paying. The net interest margin made by the US banks by lending the money back to the US government in the first 6 months of 2011 is $211 billion. The financial crisis was created by the biggest US banks to consolidate power. The top 6 US banks had assets of less than one fifth of US GDP in 1995. Now they have two third of US GDP. The big banks became stronger as a result of the bailout. They’re turning that increased economic clout into more political power. Due to oligarchs’ rapacious looting and their purchase of a politically-protected luxurious lifestyle, the US citizens are on the road to permanent serfdom under a police state. The economical problems in Greece, Spain, Portugal and Italy are very precarious. The bailout phenomenon is not working in Greece which is on the brink of defaulting on its debt. It is impossible for the EU to bailout Italy which is the third largest economy in Europe. Recently the head of the European rescue fund Klaus Regling said that the EU could issue bonds in Chinese renminbi(yuan) and not in euro. India, 4th largest GDP and populous democracy in the world has joined with China and Russia questioning US$ as reserve currency. India’s famed white marble monument to love “Taj Mahal” had charged US$15 or 750 Indian rupees as entry fee for each tourist, has been not accepting US$ anymore. Brazil, Russia, India and China (BRIC)are buying each other’s bonds and swapping currencies to lessen dependence on the US$. These four countries are among the biggest holders of US Treasuries and have combined reserves of almost 3,000 billion US$. The value of the US$ declined significantly during the last 70 years. The value of the US$ in 1940 was worth 2,000% more than the value of the US$ now. The day OPEC stops pricing oil in fiat dollars, is the day the USA will collapse completely. The reason the fiat dollar game has gone on as long as it has the US$ as the global reserve currency. In 2011 Russia began selling its oil to China in rubles. The US debt crisis adds new urgency to the China’s efforts to promote its currency renminbi as an alternative reserve currency. China has already signed bilateral currency swap agreements with several countries ranging from Indonesia to Belarus and Argentina to promote its currency renminbi as a means of settlement in international trade. China’s growing trade and financial links with the rest of the world will make the renminbi more acceptable. If countries continue to lose their willingness to hold the US$ the impact to the US$ and the collapse of the US$ could be very dramatic.